St. John's is a landscape not only of streets and buildings, but of human experience -- this is what makes up the unique character of our city. The place is full of stories, but they’re usually kept inside the heads of those of us who live here. That is about to change. Most city maps provide a satellite view or a graphic layout of the street grid. [HERE]SAY is something new: a story map. It features personal stories set in specific locations in the Downtown. As of June 19th, strollers on Water Street will find [HERE]SAY signs on 26 light poles. Each sign will display a phone number and a 3-digit code. Pedestrians will be able to dial the number on their mobile phone, punch in the code, and hear a story about the very spot where they are standing. St. John’s residents have contributed more than forty personal Water Street memories. The unusual project is created by Chris Brookes and Dale Jarvis with designer Mike Mouland, and is affiliated with the Toronto-based oral history project [murmur]. 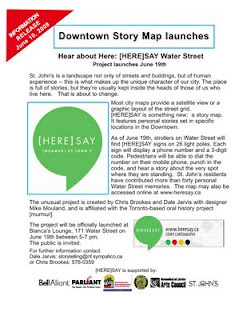 The project will be officially launched at Bianca’s Lounge, 171 Water Street on June 19th between 5-7 pm.